The NFL and NFLPA have exchanged proposals on revamping the league’s controversial disciplinary system, according to union head DeMaurice Smith, and it seems the NFL has put one major concession on the table: the removal of commissioner Roger Goodell’s powers to impose punishment for off-the-field actions. 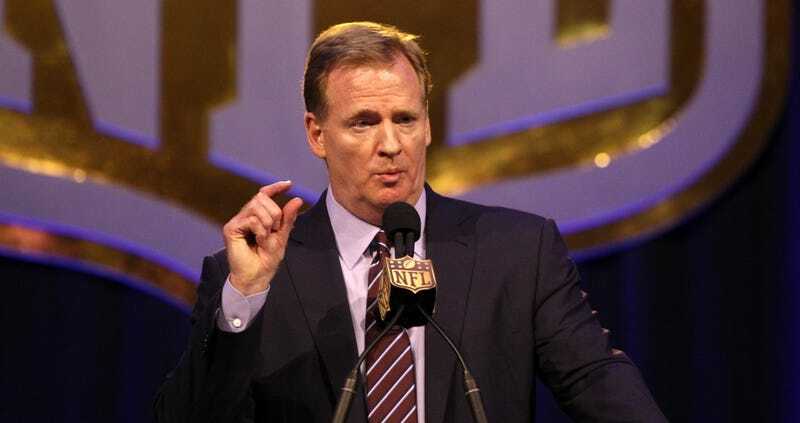 Currently, Goodell acts as judge, jury, executioner, and appeals court—he (or an underling) imposes discipline, and if the union has a problem with a player’s punishment, they can appeal...directly to Roger Goodell. It happened with Ray Rice, it happened with Adrian Peterson, it happened with Tom Brady, and in each case, Goodell’s rulings were overturned by a neutral party—either in court or by an arbitrator. It’s not a good arrangement for anyone. Not for the players, who don’t think they’re getting a fair shake within the system, and not for the NFL, which has seen its authority eroded and its public image damaged. Goodell hinted at this back in the fall, claiming that his job as disciplinarian is too time-consuming—but also noting that he’d prefer NFL matters not to make it to court. One proposal that has been discussed, according to the Wall Street Journal, would be giving disciplinary powers over to a three-person panel of arbitrators. It’s not clear how this would square with Goodell’s earlier insistence that he remain the final arbiter of appeals, even if he foregoes his role in meting out fines and suspensions. The big question, ahead of next week’s owners’ meetings, is when and how this change could be implemented. It’d be a big concession on the NFL’s part, and it’s going to want something in return. One idea discussed would be the NFLPA willing to extend the current CBA past its 2020 expiration date, but De Smith told the WSJ that’s not on the table; there’s a ridiculous amount of money coming into football right now, and the players feel they need a new CBA to correct the imbalance of where that revenue is going.